Looking for some hot jazz of the traditional variety? Get your special event off on the right AND left foot....because your guests won`t be able to stop tapping their feet to the dixieland jazz rhythms! There is no better way to get people in a good mood than to listen to exciting good-time music performed by highly talented musicians. Whether it be jazz for your wedding reception, birthday party, anniversary, business lunch or just drinks on the lawn you can rest assured that The Dixielanders Jazz Band will make your event will go with a swing! Phone 07929 417933 NOW to Book The Dixielanders Jazz Band Today ! The Dixielanders play 'Trad' Jazz in and around South Wales and The West Country and regularly perform in and around Cardiff, Swansea, Newport, Bridgend, Neath, Bristol and beyond.. 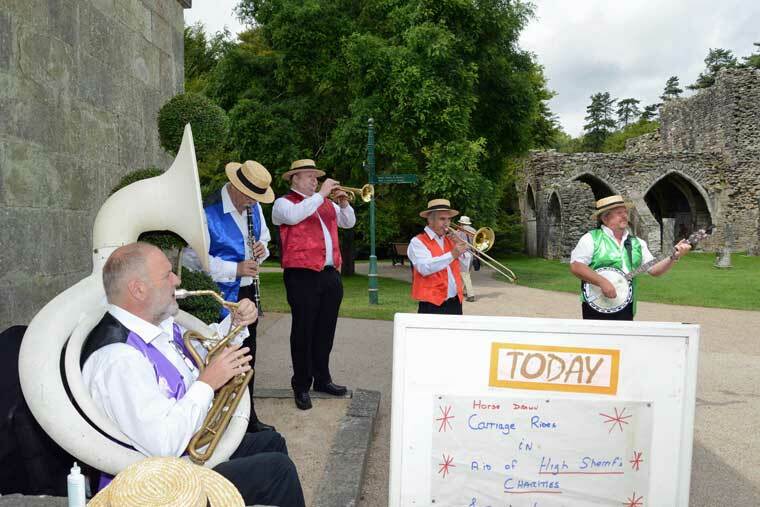 The Dixielanders at the Great Dragon Ride launch with Martin Clunes - As featured on ITV News! The Dixielanders are a very versatile jazz band and to this end can perform as a 4, 5 or 6 piece ensemble to accommodate your occasion and/or budget. 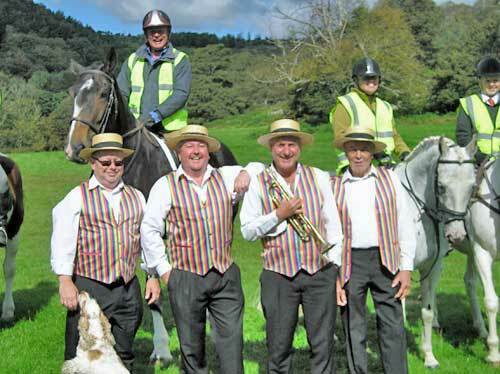 Based in South Wales, The Dixielanders Jazz Band have appeared on S4C`s long running series “Pobol y Cwm” and can currently be seen and heard performing live jazz on a regular basis at the new racetrack at Ffoslas. Mark and his team of superb jazz musicians ensured our party got off to a flying start. Playing at the beginning of the reception ensured that guests relaxed as they entered the room. The toe tapping, happy, pure sounds had everyone in the mood to celebrate. They were able to include my favourite Wild Cat Blues and I am sure that Monty Sunshine himself would have been proud. Just to say an enormous thanks to you and your fellow players for helping to set the scene for Saturday night's party. We had so many lovely comments with everyone saying "The drinks in the house whilst the Jazz band played was just wonderful"
We will certainly be on the phone if we have another function. The Dixielanders' extensive set list contains all the ol' favourites and many many more!